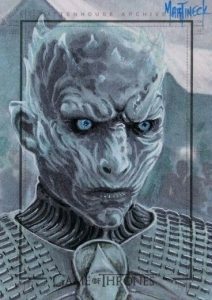 Looking back on the craziness of the sixth season, 2017 Rittenhouse Game of Thrones Season 6 continues to provide a detailed breakdown for collectors. 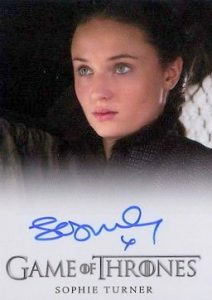 Every box includes two cast autographs from the series. 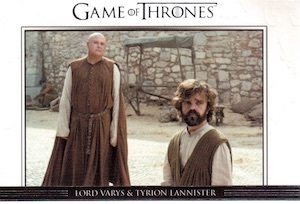 Just like previous releases, the 100-card base set offers an episodic recap of Season 6 as well as almost 70 character biographies. Adding to that are Foil parallels that average 1:3 packs while Gold parallels are a box hit at 1:24 packs. 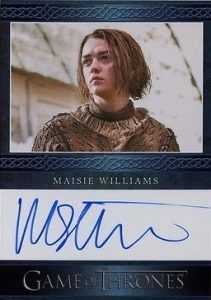 Promising many new signers, 2017 Rittenhouse Game of Thrones Season 6 contains two Autographs in every box. 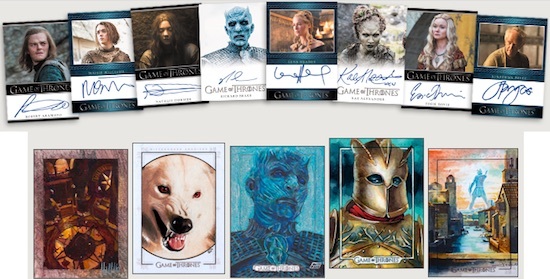 Other premium options for collectors to chase include Relics and Sketch cards that combine to fall one per case. 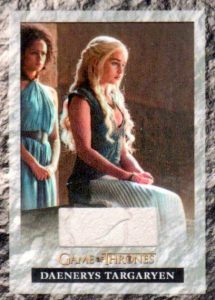 Of particular note, the relics include the first costume cards featuring Emilia Clarke as Daenerys Targaryen. 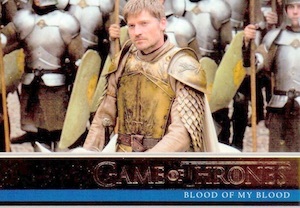 There are also several inserts to track down in 2017 Rittenhouse Game of Thrones Season 6. This includes familiar options like Quotable (1:12 packs), Relationships (1:24 packs) and the striking Beautiful Death Art (1:24 packs). Hall of Faces is a new, and very tough, insert at 1:96 packs. The Relationships and Beautiful Death Art inserts also have Gold parallels (1:144 packs). 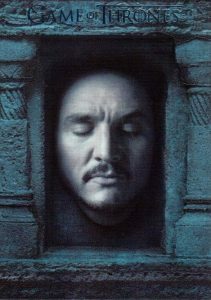 Collectors who normally open larger amounts of GoT products also have several incentives with 2017 Rittenhouse Game of Thrones Season 6. 100 cards. Shop complete base sets on eBay. PARALLEL CARDS: Foil (1:3 packs), Gold #/150 (1:24 packs), Printing Plates 1/1 (Archive Box). 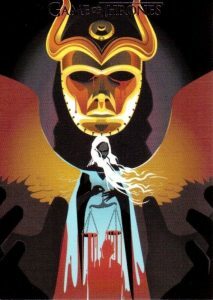 42 Sandor Clegane "The Hound"
61 cards. 1:12 packs. 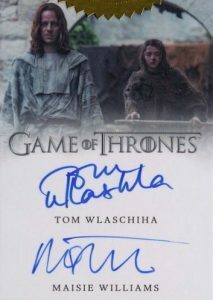 Shop Autographs on eBay. SP Print Runs: L = Limited (300-500 copies), VL = Very Limited (200-300 copies), EL = Extremely Limited (100-200 copies). Anything without a SP notation is considered Normal, with a production range over 500. Exclusive autographs not found in packs. Obtained by making specific case purchase totals. 20 cards. 1:24 packs. Shop on eBay. 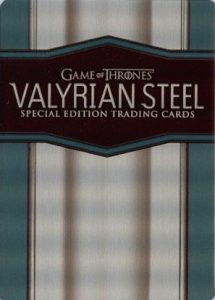 PARALLEL CARDS: Foil Parallel #/150 (1:144 packs). 10 cards. 1:24 packs. Shop on eBay. PARALLEL CARDS: Gold (1:144 packs). 16 cards. 1:96 packs. Shop on eBay. 10 cards. 1:12 packs. Shop on eBay. Shop sketch cards on eBay. 1 card. Shop on eBay.